Firmware updates are part of the maintenance of your electronic devices. The Shure Update Utility (SUU) is a free desktop application for Mac and Windows that downloads, stores, and sends new firmware versions to connected devices. 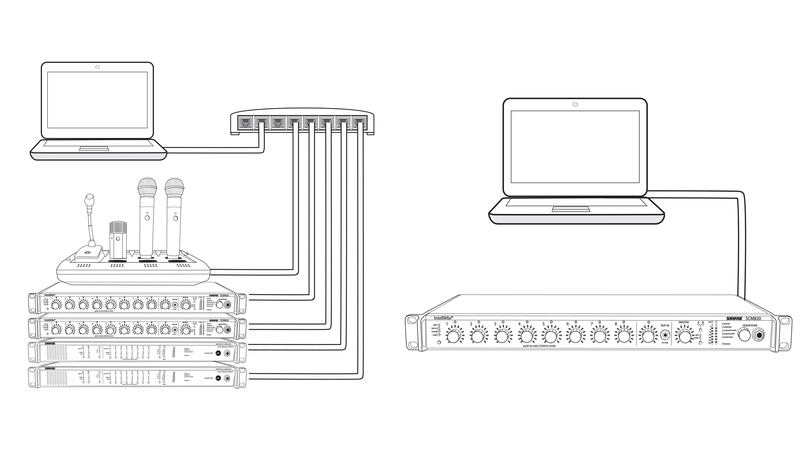 Shure Update Utility streamlines the process of updating the firmware and software of compatible Shure products. After downloading firmware to the SUU, devices can be updated offline if your system is in a location without easy internet access. 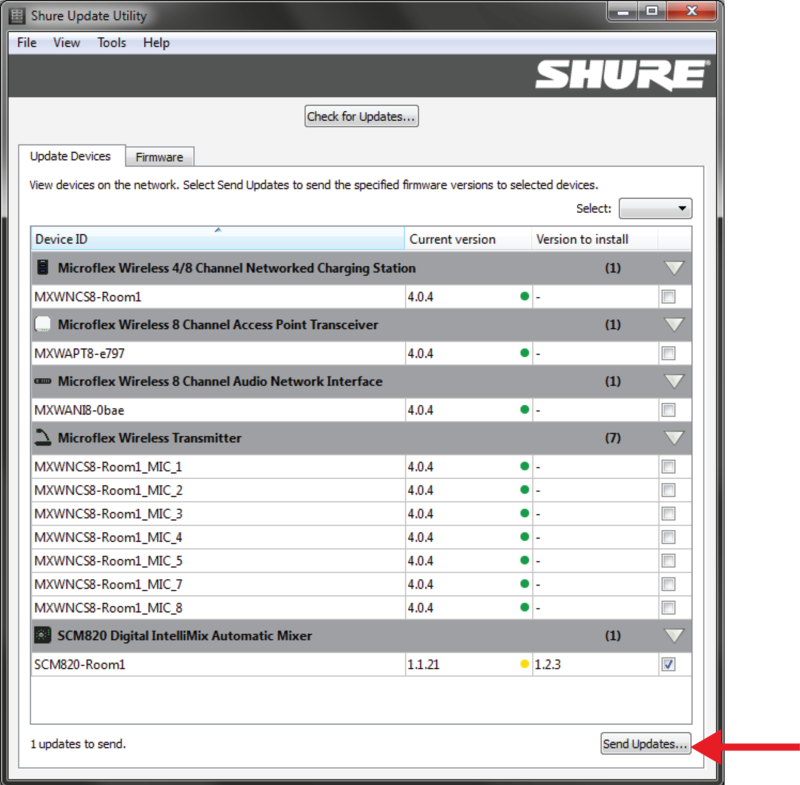 To download the latest firmware versions, open the Shure Update Utility. 1.) Click the Updates button at the top of the window to open the Download Manager. Note: This button will be labeled either "Check for updates..." or "[#] updates available"
Tip: The dropdown in the upper right allows you to quickly select all or select none. 3.) Click Download, and then Close the Download Manager. Downloaded firmware is listed and can be viewed and managed in the Firmware tab. Connect your device or network switch to your computer. A wired connection is required when updating device firmware. A network switch can connect multiple devices simultaneously. A "star" configuration is not required, but is strongly recommended. 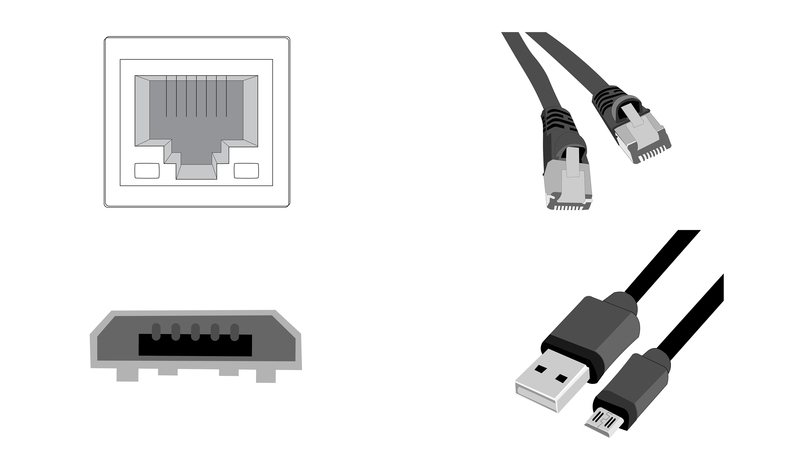 Connect the Ethernet or USB port on a single device directly to your computer. Once you've downloaded the firmware, close the Download Manager to return to the main window. In the Update Devices tab, all items to be updated are preselected. Caution: Do not turn off, unplug or disconnect the system during a firmware update. If an interruption occurs, reconnect the device to your computer and send the relevant updates again. 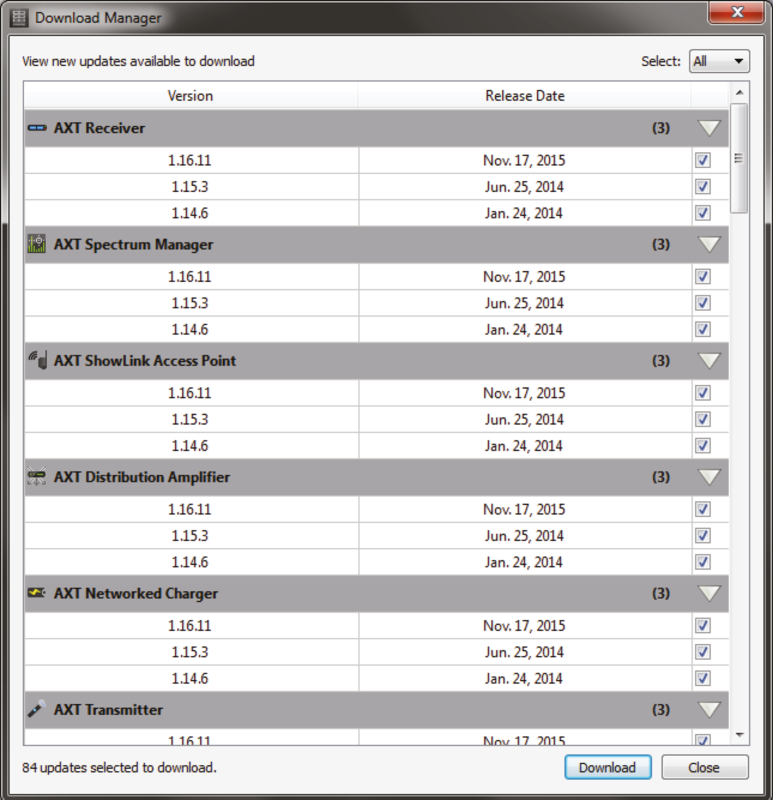 Firmware updates may include firmware for associated wireless components. Certain systems support updating of transmitters when docked in networked charging stations. Others can be connected to your computer directly via USB. These systems can be connected to your computer and updated through the SUU. The following are some of the most common issues SUU users have reported. If your issue is not addressed here, please contact customer support. Once all components are powered on and all the physical connections have been checked. Make sure you've selected the computer's network interface card (NIC) that corresponds with the wired connection to your Shure hardware. To view or change the selected NIC, go to Preferences>Network in the SUU. If the proper NIC is selected, check your computer's firewall settings and make sure the SUU is listed as an allowed application. Log in to your computer as an administrator to gain full access to your firewall settings or contact your IT administrator for assistance. For third-party firewall software, refer to the manufacturer's instructions for granting access to each instance of an application (there may be more than one instance). Tip: If you receive an alert pop-up that blocks the SUU, check the boxes to allow access for all networks (Domain Networks, Private Networks, and Public Networks). Note: Some systems require Power over Ethernet (PoE) in order to be discoverable. Make sure your network switch provides PoE, or use a PoE injector. SUU is locked in "discovering..."
When devices in the Update Devices tab constantly shows discovering..., make sure your computer and your Shure hardware are connected to the same subnet. An asterisk next to the current firmware version indicates a problem with the firmware installed on the device. If you are unable to update to a new version, try reinstalling the current version. This may take several attempts. After the current version installs correctly, you may update to the new version as normal. If you need an older firmware version that is no longer available from within the SUU, you can visit our Firmware Archive. Note: To install firmware downloaded from outside the SUU, you must first download the desired .pack files and import them into SUU from the “Firmware” tab. You will then be able to install the appropriate firmware as described above.